I’ve never been bitten by a snake. I’ve seen snakes. No, I’m not counting any zoo sightings. I’m referring to riding a bike along a sun-dappled path, hiking a trail through a jumble of boulders, and even a few times around my local suburbs. Yep . . . seen ‘em, nearly stepped on ‘em, and have gladly circled wide of many short and long, still or slithering snakes. But I don’t fear the creepy, crawlies like the fictional Indiana Jones. Don’t label me with ophidiophobia! Here, we could engage in a verbal tussle about God as a mean-spirited punisher vs. a compassionate creator. Hey, I don’t want to believe in a God who unleashes snakes! I don’t want to believe in selective punishment for certain sinners. I don’t want to believe in a God who initiates pain and misery and death. 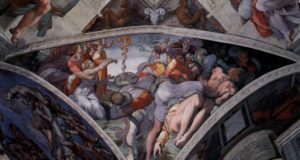 I’m way south of lukewarm about a God who—so said the Bible—had his favorite human chum Moses concoct a snake-bite cure based on an odd symbolic serpent wrapped around a bronze pole. Look at the serpent of bronze and live, the writer of Numbers exhorted. Blech! No thanks! And yet I do have wounds. I don’t think a vengeful God punished me, but some scars were certainly caused by my foolishness. My weaknesses. My sin? There’s the faded line under an eye where a swing struck my face . . . I shouldn’t have been chasing my sister ‘round and ‘round the playground. Bam, the swing hit me! There’s the odd wrinkle on my left middle finger because a doctor repaired my crushed digit with stitches . . . I shouldn’t have been so lackadaisical with the equipment at a job during a college summer. Bam, an iron bar hit me. My left leg sports pairs of weird dimples below the knee and around the ankle—wounds if you will—where metal pins once held broken bones together. I shouldn’t have “blindly” slid down that snowy mountain slope without noticing the jagged rock outcroppings. Bam, I hit an unforgiving slab of granite. I’ll bet you have scars with stories you’re proud to share or ashamed to ever mention. Though I’ve seen Steven Spielberg’s Jaws numerous times, I always relish one particular scene. Sure, I’ll jump when the shark first appears. And there’s great lines like You’re gonna need a bigger boat and That’s some bad hat, Harry. 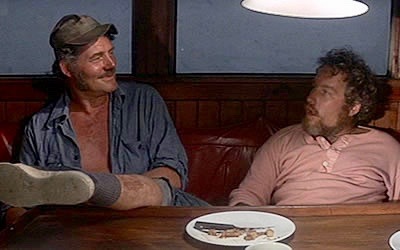 For me, though, the scar “contest” between Robert Shaw’s Sam Quint and Richard Drefuss’ Matt Hooper is best of all. Back and forth they banter, exposing old scars, one-upping the other guy with tragic tales. Scars are memories. Scars are missing bits of flesh that flesh out the worst and best of life. If you can show your scar, you’re still alive. You survived. If you’re no longer whole, at least you’re not in a hole in the ground. You can’t see my worst scars. Most are healed. But a few I pick at, never allowing them to properly mend. I can’t show you the wound from my long-ago divorce. But it’s there. I can’t show you the bruises my father caused when he ordered me to leave his house. Sure, I now know Dad’s paranoid yelling was influenced by a dementia my family hadn’t yet identified. But those bruises linger because of how hurtful he sounded and how much anger I held within. I can’t show you the gash in my soul when a fellow pastor lied about me. He deceived others and knifed away part of my future. I don’t doubt a certain amount of cynicism for the institutional church was borne from his actions. But, no blood, no foul, right? I won’t (or can’t) write about other invisible scars. I am snake bit! If not God, then the world has unleashed serpents on me, and I’m ashamed of what I’ve done . . . or not done. If not God, then my arrogance has unleashed serpents on me, and I’m a petty, petulant man/boy because of what I’ve said . . . or not said. In the unnerving imagery of John’s Gospel, all the wounds I won’t share are reminders of me loving “darkness rather than light . . .” (John 3:19). This I believe: living in God’s good world means we’ll never avoid the fresh wounds and old scars. But how will we treat them once our souls are marked, once our hearts are broken? Currently I’m leading our spring grief support group for those who have had spouses and partners die at a hospice. All participants suffered losses that left crater-sized wounds on their souls. Several commented how grateful they are just to have a place to share grief with those who also grieve. Who among us is not wounded? As a solitary and feeble example for some grief groups, I have shared one of the most healing things I ever did. During the worst of my long-age divorce, I gave “permission” to several close friends to ask me how I was doing and then promised to honestly answer them. I craved support while anger, self-hatred and fear battered my heart like bulldozers. Thanks be to God, a few friends became my “light,” my bronze serpents. I could gaze upon (and be seen by) the love of God-blessed friends who tended my wounds. Maybe in this Lenten week, you’ll be Moses’ bronze serpent for another. Or you’ll courageously turn from a “poisonous serpent”—an unhealthy situation or relationship—and seek supportive “lights” in your life. Another good one, Larry! Sorry to read about your divorce. Never an easy thing to deal with but hopefully you’ve moved on from that experience. Please keep these reflections coming!! Was wondering if you read Kate Bowler’s book everything happens for a reason? Appendix 1 explains it all.